On 11 December, team members met in an ‘Outreach Meeting’ with various stakeholders and partners. The aim of the meeting was to continue synthesizing the key insights of the project through interactions with a wider community. For the outreach session, the project team worked on three main messages emerging from the work. Using a ‘bus stop’ approach, groups of participants interacted around the different issues using informal ‘posters’ prepared by the teams. 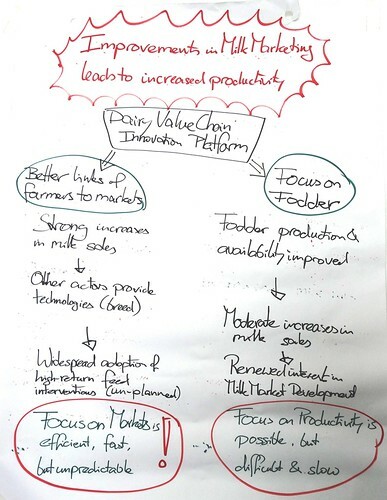 The two main tools used to target interventions in the project were dairy value chain assessment and FEAST. 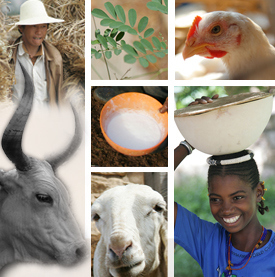 The dairy assessment tool focuses on the wider set of actors related to feed and market linkages whereas FEAST is a systematic approach to assess whether feed is an issue in a given situation, as well as any specific constraints and opportunities. 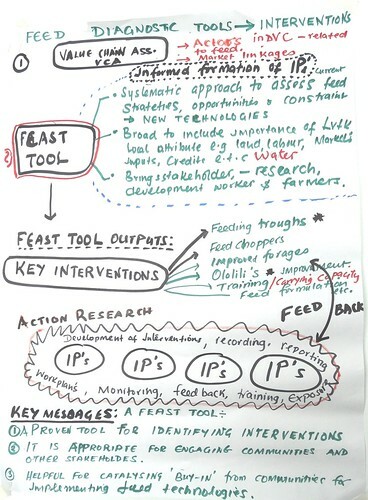 FEAST is used in a process of farmer-centred diagnosis to pinpoint what needs to be done within the specific local context. Key messages are that this is a well-tested and proven tool that helps identify suitable interventions. Moreover, it engages the communities and other stakeholders in discussing and assessing the various options and it has been helpful to build ‘buy-in’ from communities to implement feed technologies. In India, the various assessments were also used as part of the community baseline activities and provided a basis to re-visit communities over time. See the video synthesizing this key message. One key characteristic of the project was to address both milk marketing and dairy feeding issues. In fact, the project’s hypothesis was that improvements in milk markets would lead to increased productivity (and more milk production) in the different communities. This team explained how the innovation platforms in each country tackled this question in a different way. In India, the project deliberately sought to link farmers to markets. Farmers found various ways to market their milk such as setting up their own marketing organization or actively seeking increased collaboration with the state dairy co-op. Once milk started to be sold, other interventions, including those promoted by other organisations, were identified and implemented, which led to improved efficiencies and increased milk production. This all led to strong demand and subsequent widespread adoption for improvements in feed supply, such as better links to concentrate suppliers or reducing feed wastage through adoption of fodder troughs and choppers – interventions which had not been envisioned at the project outset. In this case, the focus on development through market linkages proved to be efficient and fast, but rather unpredictable. 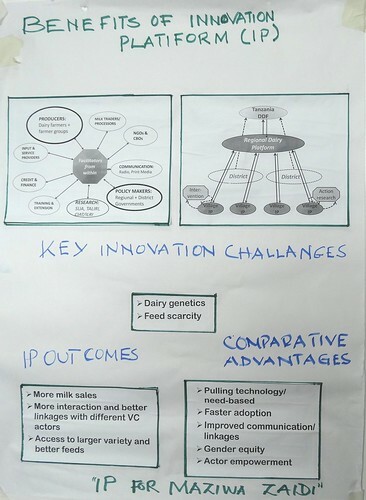 In Tanzania, the innovation platforms concluded that addressing milk market issues directly would be difficult. Thus, the entry points were focused around fodder and forages, increasing their availability to farmers. This led to some increases in milk production and ultimately to more efforts to connect to the markets. In this case, the focus on development through productivity (of animals) had positive results, but was quite difficult and slow. These cases stimulated a lively discussion on phasing dairy development. Should farmers connect to markets and use the market ‘pull’ to drive productivity increases? Or, should farmers focus on increases in milk productivity which will attract the processors, for example, to come to them. Arguments went both ways with no definitive answer. However ILRI’s Nils Teufel who led this session did conclude calling for people to ‘Go for the market, go!’ See the video synthesizing this key message. Innovation platforms were set up at different levels as part of the project. In Tanzania the focus was on village platforms as well as a regional one for Morogoro (connecting to and complementing an existing regional one for Tanga). In India, the platforms were set up for village clusters and initial work was done for a district platform. The key messages were that the platforms benefit the farmers and other participants. They resulted in more milk sales, more interactions and better linkages among different value chain actors and, in Tanzania, access to a larger variety of better feeds. In terms of their comparative advantages, the platforms were perceived to be need based (they pulled technologies), providing faster adoption, improved communication linkages, and fostering gender equity and greater actor empowerment. See the video synthesizing this key message. Tags: IFAD, innovation platforms, milkIT. Bookmark the permalink.